The Delaware Association for the Education of Young Children (deaeyc) is the administrative home and licensee for T.E.A.C.H. Early Childhood® Delaware. Child Care Services Association (CCSA), North Carolina, has agreements to license the T.E.A.C.H. Early Childhood® Projects in 24 states. Who funds: The scholarships are a partnership between students, sponsoring centers and T.E.A.C.H. Delaware. Currently, T.E.A.C.H. 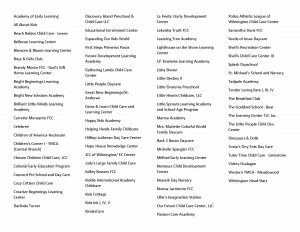 Delaware is funded by Delaware Department of Education’s Office of Early Learning and Delaware Health & Human Services. Who benefits: The children being cared for benefit the most from having higher qualified teachers. The programs that our recipients work for benefit by helping increase the professionalism at the program. T.E.A.C.H. participation can also count as a benefits for Delaware Stars standards and help gain points for higher qualifies staff. And, lastly, the teachers benefit. Teachers learn more in depth knowledge to help them provide the best care possible and earn a college education without going into debt with student loans! Travel Stipend has been increased to $150 per semester and the T.E.A.C.H. bonus is now $500 with the Sponsoring center giving either a 2% increase or $200 bonus. DTCC is now accepting the CDA certificate for prior learning credit. Please see the department chair at your campus to find out more! DTCC has nearly 40 credits towards the early childhood development and birth to 2nd degrees available online with many ore available in a hybrid format! Springfield College's Human Services w/ ECE concentration will be available 100% online beginning Spring 2019.